We propose – through the space of Petriplatz – to highlight the conventionally understood nature of Berlin as a city of diversity, a city of change, and a city of unity. These tropes are probably as common an undercurrent of the history of Berlin as their opposites, though within Berlin they hold special capital for those attempting to forge new alliances, welcome new arrivals, or at least transcend old divisions.The space of Petriplatz can be understood as a microcosm of Berlin and a past analogue of its present and future. It is potentially a window into the arbitrarity and urgency of identity. Spaces like Petriplatz are sites of imagination, they are the foundations of not only new unions and old divisions, but of the intra-subjective boundary object of experience. Some look at Petriplatz and see the old city of Cölln, others see the foundations for the House of One, but regardless they see something and they imagine what it is or will be like. This space has burned, it has been buried, it has been demolished, buried again, it has been dug, and it will be built again. Out of the diversity of context the site has existed within, it has remained a sort of heart of Berlin, where communities have spontaneously formed and defined themselves going back to at least the beginning of the second millennium of the common era. Capturing community or culture, is perhaps almost as problematic an endeavor as capturing an agreed upon god, neither enjoys a popular conception or definition, but we talk about both endlessly. Perhaps culture as process – ritual – is a way to bridge gaps, to create that boundary object of shared experience out of our different perspectives. To us this is a part of the beauty of the House of One. It reminds us of another tradition, found across the planet in different contexts. The blown or stamped hands are a symbol of the ritual of little “a” art seemingly going back to those first humans to understand that communication was not simply a transient given, but a documentable act capable of beautiful and arbitrary elaboration. The blown and stamped hands are a symbol of identity, the first tags, the first artistic style, the first artistic movement, the first artistic revolution. They definitely had ritual significance beyond what we call art today, the magic of creating something, representing something, divining something, praying for something. But there is also something so transcendently human about the hands, reaching across time. We, Ali*Mal, believe that the fingerprint in our global-mass-media-influenced culture is the closest bodily analogy to the hand that exists today, more personal, often related to invasions of privacy or the loss of individuality in the form of incarceration or negative interactions within our legalist society, the documentation of the subjected and observed . . . it is also concomitantly a precious form of identity, one that is shared with everyone albeit never the same way from even one finger to the next. We intend to fuse these meanings, the image of the blown hand with the conventional understanding of the fingerprint, hijacked to communicate something personal, a merging of persons and communities. The installation Unser Fundament by the collaborative team Ali*Mal (artist/writer* anthropologist/scientist/historian) is a composite image created from 12 hands. The outline is the right and left hand of the two artists. The fingerprints are each from an individual, anonymously representing five communities related to the space: The archaeologists who excavated the site, Members of each of the three religious groups who will be building the House of One, Muslim, Christian and Jewish, Students who will be taking part in an educational program at the site. The personal materials, and decisions about which fingerprints to use, will be handled anonymously via a double-blind collection-indexing system. The outlines of the hands are created by blowing ground charcoal over the two artists’ hands and enlarging the silhouettes through a grid method. 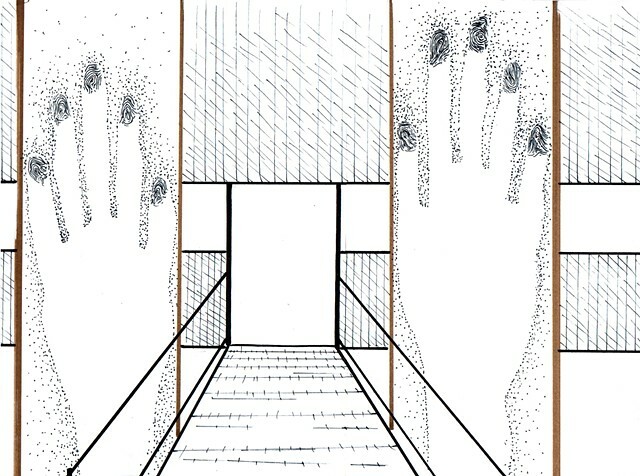 The fingerprints are collected in an anonymous way from members of the five communities, also enlarged and drawn with charcoal inside the hand outlines. The use of charcoal resonates personally with Ali as it has been her material of choice since 2012, but additionally with the site as fires repeatedly destroyed structures, creating ash which in turn aided preservation. An element of creation out of destruction. The two composite hand images will be translated into two large scale drawings made on German-woven cotton. These works will be hung from the ceiling above the Petriplatz archaeological site, on either side of the ramp leading into the space. The public will enter for the time allotted, walking between a physical representation of the new community being built at Petriplatz. Die großräumige Installation ist ein aus 12 Händen zusammengesetztes Bild aus Kohle, welche auf in Deutschland gewebte Baumwolle aufgebracht wurde. Die Handumrisse zeigen die jeweils rechte und linke Hand der beiden Künstler. Die Fingerabdrücke stammen von anonymen Einzelpersonen, welche die fünf mit dem Platz verbundenen Gesellschaften repräsentieren: Die Archäologen, welche die Stätte ausgegraben haben, Mitglieder der drei religiösen Gruppen, d.h. Muslime, Christen und Juden, welche ‘House of One’ errichten werden, Studenten die an einem Bildungsangebot an der (Ausgrabungs-)stätte teilgenommen haben. Kohle ist seit 2012 Ali’s Lieblingswerkstoff. Außerdem steht das Material in in besonderer Verbindung mit dem Petriplatz, welcher wiederholt von Bränden zerstört wurde. Hieraus entstand die Asche welche den Erhalt der Stätte begünstigte. Aus der Zerstörung entstanden wird die Kohle auf diese Weise zu einem Element der Schöpfung. Während der Öffnungszeiten erhält die Öffentlichkeit Zugang zu der physischen Repräsentanz der neuen Gesellschaft des Petriplatzes.